Willpak Large Astra Hood Scoop Willpak Large Astra Hood Scoop, Willpak 20488 Hood Scoop, Large ABS Hood Scoop, Large Hood Scoop, Hood Scoop, ABS Hood Scoop, Custom Hood Scoop, Dodge Ram Hood Scoop, Dodge Dakota Hood Scoop, Dodge Durango Hood Scoop, Dodge Nitro Hood Scoop,Jeep Commander [Willpak 20488 Hood Scoop] - $129.95 : 3rd Strike Performance, Your Source for Late Model MOPAR Performance Parts and Accessories! Wanting the look without the hassle? This all new hood scoop from Wilpak Industries is just what your looking for. In just a few simple steps, this unique addition will transform an everyday hood into the picture of high performance. Featuring a forward-facing, ram-air style, simulated intake that's specifically engineered for Dodge hoods. 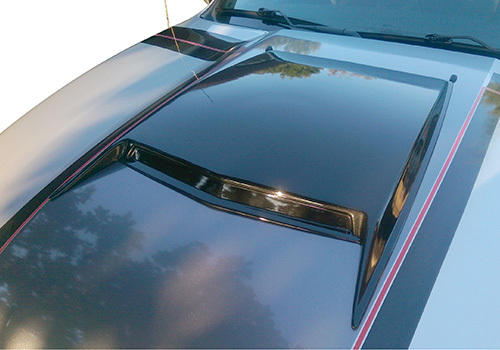 The Wilpak Large Hood Scoop mounts in minutes with concealed, pre-applied, automotive grade adhesive. Designed for a perfect fit, and is easily painted to match your factory color. Note: Hood scoop is designed to be mounted 1/2" from rear of hood. Representative photo of product is shown on a different vehicle for illustration purposes.